This Italian-style soup is cheap, nutritious, filling, and very tasty. It’s easy to make, and a sure crowd-pleaser for a bonfire night party! The cinnamon gives it an intriguing background flavour. Serve with warm ciabatta or rustic country-style bread. Serves 4. 1. Pre-heat the oven to 200 degrees C/ fan oven to 180 degrees C/ or gas mark 6. 2. In a greased baking tray, place the squash, tomatoes, onion, garlic, sage and rosemary, spreading everything around evenly. Season to taste, drizzle with 2 tablespoons olive oil, and toss the vegetables lightly so that they are evenly coated. 3. Place the baking tray in the oven and roast for 30 minutes until the vegetables are soft and beginning to brown. 4. Once cooked, let the vegetables cool slightly, then take the peel off the tomatoes. Discard the tomato peel, garlic, sage and rosemary. The garlic and herbs are only used to infuse the squash with flavour – you won’t need them in the soup as they will be somewhat coarse and bitter on the tongue. 5. Heat the stock in a soup pan and bring to the boil. Add the pasta, cinnamon and chilli flakes, and simmer, uncovered, for 5 minutes. 6. Add the roasted vegetables and beans, and simmer for a further 5 minutes until the pasta is cooked. Add more seasoning to taste. 7. 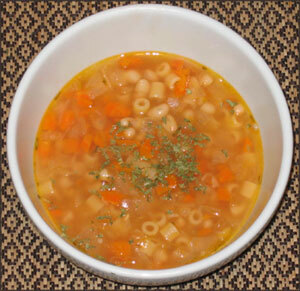 Ladle the soup in individual bowls, and sprinkle with parsley, cheese and, if desired, a little more olive oil.